Have you ever wondered by windscreens don’t break like a glass dropped on the kitchen floor? The glass used in windscreens is a specially treated glass made for automobiles. 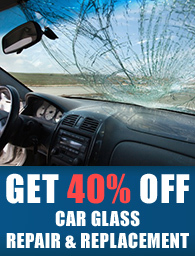 The treatment of auto glass renders it shatterproof. Early automobiles didn’t have windscreens and drivers used goggles to protect their eyes. The first windscreens were made of ordinary glass which shattered on impact sending sharp shards of glass flying in all directions resulting in serious injuries and death for motorists. The introduction of shatterproof laminated glass for windscreens was first used by the French and later adopted by Ford Motor Company. The more resilient glass has evolved over the years and modern technology has allowed for the creation of laminated safety glass. Similar in concept to earlier versions of laminated glass, today’s windscreens are made of two layers of glass with a layer of laminate in the middle. Laminated safety glass is not only used for Windscreens, it is also used for glass doors and glass structures or any place where human impact is a possibility. The laminate layer is usually made of polyvinyl butyral or PVB. The layer of PVB laminate strengths the rigidity of the glass. Laminated safety glass forms spider web like cracks upon impact instead of shattering into dangerous shards of glass. Laminated safety glass is manufactured using high tech robotic equipment to perfectly fit the two layers of glass with PVB laminate layer. This technology ensures that all windscreens meet precise specifications. The finished windscreens are inspected my human inspectors to check for any imperfections in clarity or for scratches. If the windscreens pass this inspection they are tested for strength. This test uses a steel ball, the approximate size of a human head that is dropped onto the windscreen. If the ball cracks the glass it fails the test. If the windscreen shatters it also fails. There are three sources and types of windscreens. The first is dealer windscreens. This type of auto safety glass is custom fitted for specific models of automobiles. The next type of windscreen is called original equipment manufactured or OEM glass. This auto glass meets the same specifications and standards as the glass manufactured in the automobile maker’s factory. The clarity of OEM glass is superior to aftermarket windscreens. Because of this, OEM windscreens are more expensive. The last type of windscreen is called aftermarket windscreens. This type of auto safety glass in independently manufactured and is less expensive but also not as sturdy as the windscreen that came in the car when it was new or OEM windscreens. Aftermarket windscreens do not have the same warranty as OEM windscreens or may not have a warranty at all. All windscreens must meet certain safety specifications, if you have questions about the differences and how those differences may affect your safety or warranty question please call Fast Car Glass at 07707550375 or 08000842929 for additional information or to repair your windscreen or replace any car glass.